The last device on the DMX line must terminate the line to avoid serious signal degradation due to signal reflections and external electro-magnetic interference. Some modern devices have a switch on them to tell them that they are the last device on the line and that they should terminate rather than expect something to be plugged into their DMX out port. Other devices can sense an empty out port automatically and act according to terminate the line. There are some pieces of equipment which do not automatically terminate and do not feature built in termination and in these cases, termination must be supplied. 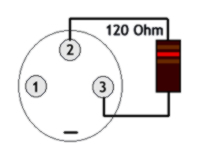 The best way of doing this is connecting a resistor between 100 and 120 ohms in size across Data + and Data – as shown in the diagram above left. DMX lines can be run a maximum distance of approximately 1500 metres, and each line can support a maximum of 32 devices. Transimitting devices and DMX out ports on devices should be female connectors, while DMX in ports should be male connectors.